Glamorous Embroidered Dial-Demure, classical design with delicate floral embroidered face and 24k gold watch case. this luxury watch is so precious and elegant to exude an antique charm. to be a luxurious estate added to your collection and investment list. Delicate and Excellent Craftsmanship- 38mm big-faced with sapphire glass is very clear to display the time. the floral embroidery painting with vivid color is so attractive and noticable, which creates timeless elegance with personalized style. Comfortable and Versatile- Boasting a striking bold dial and gold case, as well as a customized strap, this sleek watch is coZy to wear and suits every outfit choice. Wear this statement timepiece on special occasions to complement a dapper outfit. Precise Automatic-Self-Wind Watch-Adopted with Swiss movement. It is quality, precise and durable for years use, and run indefinitely via its wearer moving arm instead of manual winding or battery. Perfect personalized gift- It is so gorgeous, precious and memorized. Perfect for birthdays, anniversary, graduation, retirement, wedding party, promotion, business meeting, and other milestone celebrations. Warranty is 18 months. You can return it to get 80% money back 1 year after the purchase day. All personalized watch need 30 days to finish. CHIYODA luxury watch, a classical and glamour accessory that will never outdate with the time. A custom timepiece to show your unique personality and style. 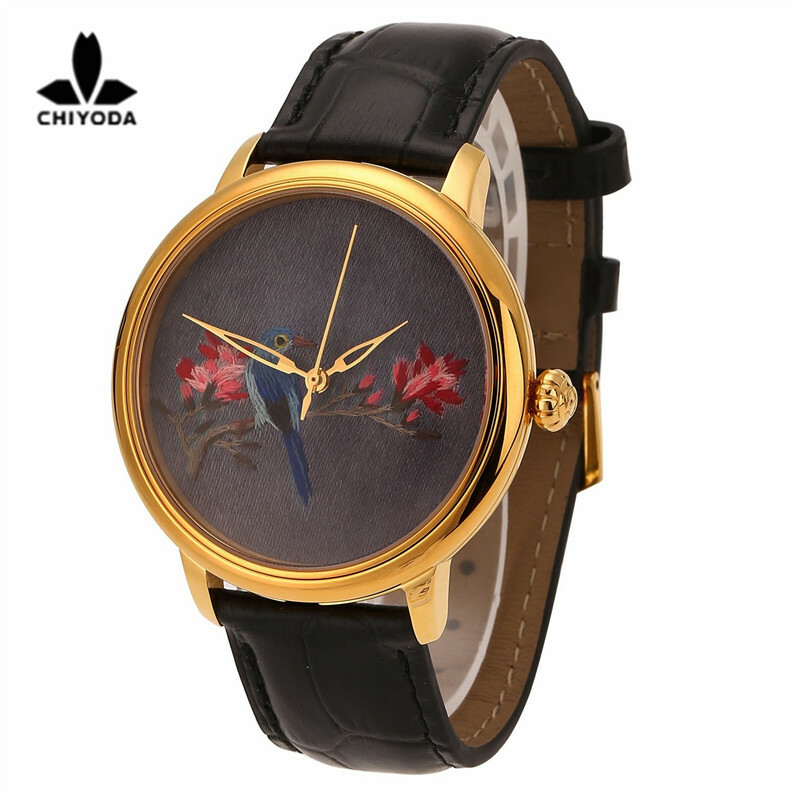 It combine the traditional painting with Su embroidery, every watch differ greatly as it is 100% handmade. It is not just a watch, but a unique work of art and elegance. Ready to show your personalized style to others and enjoy their gazing? Wearing this chiyoda gold watch, you will touch the elegant soul from centuries ago with its precious embroidered painting. It is finely crafted in every of its detail by a Su embroidery masterm, and blends beautiful embroidery dial perfectly with the golden case to create a discreet rich and elegant feeling. A real automatic mechanical movement from Swiss. Quality and durable enough to resist the erosion of time, and will last so many years' running. It is can be passed on as a heritage generation to generation to convey you love, and clearly record every precious moment with second hand moving and ticking.